Special thanks to my partners from FLY models for providing me with the review sample. The BAC Jet Provost (originally built by Hunting Percival) was a British jet-powered trainer aircraft used by the Royal Air Force (RAF) from 1955 to 1993. The Jet Provost was also successfully exported, serving in many air forces worldwide. The T4 was fitted with the more powerful Viper A.S.V. 11 of 2,500 lbs static thrust and first flew on 15 July 1960. 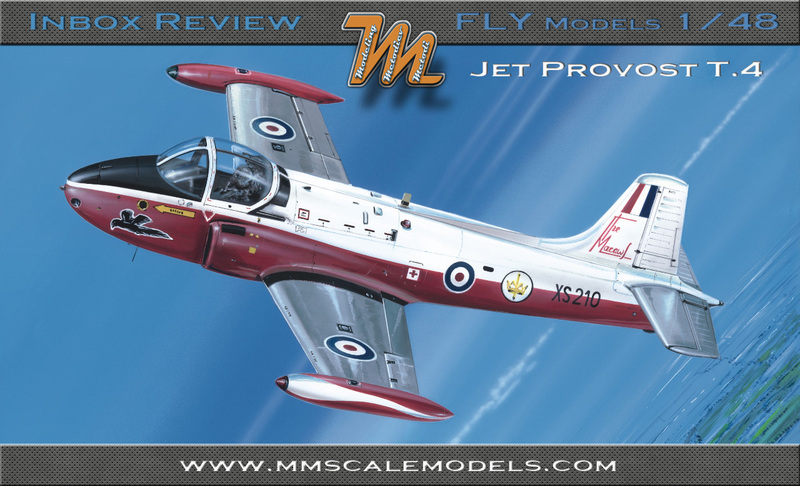 The 1/48 BAC Jet Provost T.4 scale model kit from Fly models is the latest to date from their Provost / Strikemaster lineup. It comes in side opening box with nice "painting" box art. On the back there are four four-view drawings of the different markings. Kit 48019 is comprised of two solid injection molded sprues, one transparent, eight blocks with resin parts, decal sheet and instructions booklet. They are A5 (ish) size and quite straight forward. Page one shows two colored profiles of the aircraft, the parts breakdown, colors legend and step 1 which is the painting of the resin seats. Paints call outs are only true for the instructions. The colors for the camo schemes are given on the side of the box. All in all instructions seem OK to me. There are only two things omitted - the amount of weight needed in the nose and dihedral values for the wings. Decals are in register and glossy. Carrier film is trimmed very close to the actual markings and seems to be with good thickness. There are instrument faces on the sheet but for some reason the majority of them are just black dots which makes them useless. The injection molded parts come in two beige color and one clear sprues. Panel line detail is super fine and crisp. There is flash present here and there but that's not much of a problem. There are also some ejector pins inside the wings that might need to be removed in order to have good assembly. Sprue 1 contains the fuselage halves. Sprue 2 holds the wings, horizontal stabilizers, wingtip fuel tanks, cockpit and undercarriage details. On the transparent sprue there are the canopy and a transparent section that sits behind it and various lights. There are also eight blocks of resin which provide with: two ejection seats, cockpit side walls, center console with throttle quadrant, wheels, exhaust nozzle, intakes, main gear bay detail, control columns, suspension details and two other bits. As I said earlier, panel line detail is very nice. It is crisp, fine and sufficiently deep to hold washes (well that depends on how much paint you will put on it :). They are consistent throughout the scale model with only a few exceptions on some hatches. Raised details are also nice and crisp. The trailing edges on the wings and horizontal stabilizers seem to be very thin. The instrument panel is looking rather well detailed for injection molded part. Location slots are provided for the wing to fuselage assembly, but for the tail planes and the wingtip fuel tanks there is not. There is also some panel detail missing from the wingtip fuel tank root. You'll have to scribe it by yourself. The clear parts also look good, the canopy is with good clarity and mostly distortion free. Unfortunately it is in one piece with the front windshield. and if you want to pose it in open position You'll have to cut it. Thing is though that the canopy is so big that noting will be left unseen even if it is closed. The resin bits are also with good quality and will provide your build with fine detail. The ejection seats being the most obvious item in the cockpit are really nice. They have the harnesses molded in and only need pull handle to be added. Side walls are also nice and there are some decals going on them. In general all the cockpit components will add to one busy looking office and with some minor scratchbuild it'll be magnificent. The engine intakes are provided in resin and they look the part, there is some minor clean up to be done on the inside but hopefully it'll be easy job. Exhaust nozzle is also a nice touch. Wheels have excellent tread and rim detail but don't have weighted appearance. This kit is well made and will be excellent foundation for a great scale model of the BAC Jet Provost T.4 . With a little bit of scratch build and good paint job this scale model is ready to become a masterpiece and a winner of any contest. I would't recommend this kit for the beginners because it definitely demands some experience (resin bits and lack of location points at some joints) but for those of us who have some builds behind our backs I think it is highly recommended. Please visit and subscribe for my YouTube Channel to get updated on the forthcoming full video build log of this kit. Best regards and happy modeling.